"I was sixteen the second time I had my first kiss...."
At the end of AMBER HOUSE, Sarah made a choice that transformed everything--and now she must choose it all again. Things are very different--better--for Sarah and her family: her Aunt Maggie grew up; her parents are happily married; her grandmother died after a long, productive and respected life. But other things are different too, and not for the better. Her friend Jackson shares these visions of a different world--and together, they manage both to remember the way things ought to be, and to plan a daring mission that will reset the universe once again. Sarah must figure out what has changed, and why, and how she can fix it--how she can find her way to another otherwhen. Neverwas was just as amazing, for me, as Amber House. Maybe even more so! I absolutely loved this book! It begins at the exact same place in the story as Amber House began. I know, that sounds strange, but it is true. Except, things are very different. The events at the end of Amber House have changed the world. Have changed history itself. And Sarah does not remember. Not at first. But Sammy and Jackson know that things aren't right. In this installment, segregation is alive and well. Wars that were won in our history, in Amber House's history, were lost in this history. Many things, politically, are very different. The people are very different. Sarah's parents are together and in love in this story. Her mom and grandma were close and had a loving relationship. Her mom is a good mom, overprotective, kind and nurturing. There are so many things that I could go into with this story, but I feel like it is one that you should read and learn for yourself. This book is special, to me. The relationships are special. The struggles are heartbreaking. The segregation is not an easy thing to read about. But there are so many good things in this story. So many good lessons to learn. It will make your heart swell, and then rip it right back out. One of my favorite parts about this book was seeing the changes in the people involved in the story. How different they were in this reality. And yet, at their core, there were still aspects that were the same. You are you, no matter the circumstance. There are parts of us that are to the core, that are unchanging, no matter what world we come from, no matter our history. I think the authors truly stepped up their game with this second book, and I could not be more impressed. I can't wait for the final book, especially after that ending. I think that it could be something truly spectacular, and I can't wait to be a part of it. The final thing that I want to say is this: Yes, there is segregation in the story. It is a part of the world they live in. But it is in no way glorified. It is portrayed exactly as it should be. As an awful, horrific part of our history. Something that should be fought against, something that should never be allowed to happen again. Something that should have never been, that should never have been in the pages of our history books to begin with. So, on that note, I hope that you run to the store or Amazon or your local library, and bring this series home and enjoy! Amber House wasn't really my book when I read it a while ago. I'm not sure if this would be a sequel that I'm willing to give a chance. I'm glad you enjoyed it though!! 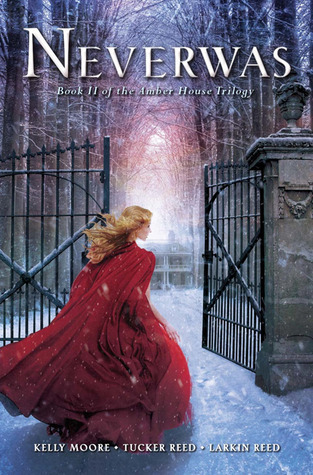 It is a completely different book than Amber House, if that might change your mind! ;) I'm sorry that you didn't enjoy Amber House. Thank you for checking out my review of Neverwas! I really need to read this one! I love the cover and the summary sounds really good. I haven't read Amber House yet, but I'm hoping to read both of these later this year. Great review!